Did you know that you can experience the abundance of Heaven right here on Earth? In this powerful series Dr. Bill Winston shares that there is another level of peace, joy, love, power, and prosperity that every believer has the ability to produce through the power of the Kingdom of God that resides within them. 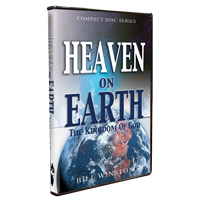 It is time to enjoy heaven on earth, and manifest the Kingdom of God that dwells within you.